Paradox; Willard H. Maxwell Jr. passed away on July 8, 2018. He was born on July 19, 1931 in Schenectady, NY to the late Willard H. Sr. and Gladys (Boissonneau) Maxwell. In addition to his parents Bud was predeceased by his brother Gary Maxwell and sister Fay Parks. Willard (Bud) married the love of his life, Jean Anderson on February 19, 1955. Bud had a forty year career as a banker and officer for Mohawk National Bank, Norstar Bank, Fleet Bank and Bank of America. A former resident of Burnt Hills, he fulfilled his life-long dream when he and his wife became "year-round" residents in Paradox in 2014. In his spare time, he enjoyed playing golf, fishing and hunting. 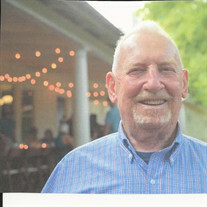 He also loved gardening, playing cards with friends and spending time with family. Bud was very active in his community, he was a Mason (St. George Lodge #6 of Schenectady), he served on the board of the Paradox Schoolhouse, he was a member of the Adirondack Mission Church, The Town of Schroon Lions Club and the Schroon Lake Fish and Game Club. He is survived by his loving wife Jean, his son David (Nancy) Maxwell of Ballston Lake, NY, his daughter Nancy Girling (Michael) of Pearl River, NY and his grandchildren, Kathleen, Erin (Andrew), and Michael Girling, and Mathew Maxwell (Leeza). A Funeral Service will be held Thursday July 12, 2018 at 4:00 PM at the Edward L. Kelly Funeral Home 1019 US Rt. 9, in Schroon Lake. The family will receive friends and relatives on Thursday from 2- 4 PM at the funeral home. In lieu of flowers memorial donations in Bud's name may be made to the Adirondack Mission Church or the Paradox Lake Association.